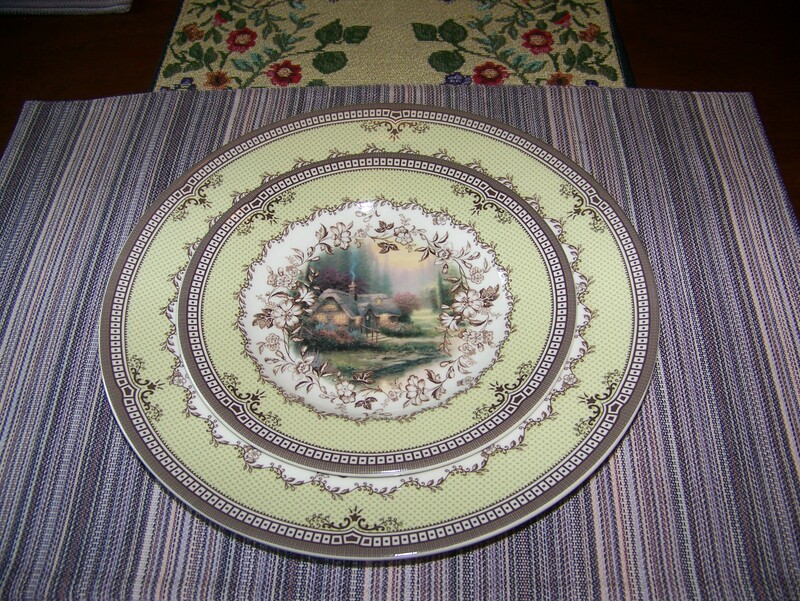 In my continued effort to purge some table linens, I am setting a table today with some placemats and napkins that I might get rid of. 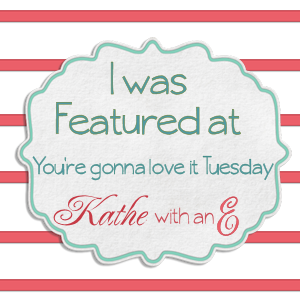 I also have an update on beauty products at the end of the post for those of you who are interested. 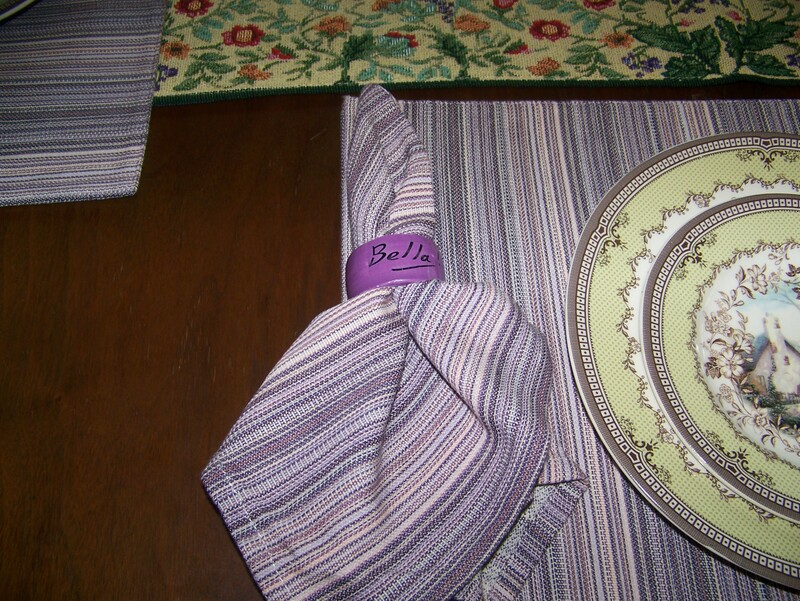 I saw the purple striped napkins when I was putting away some clean napkin and thought that I would use them and the matching placemats today. 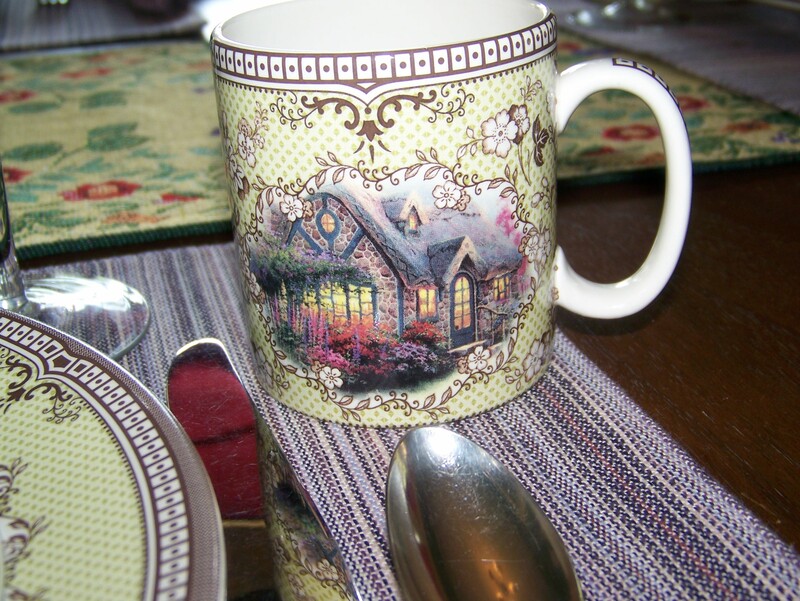 I got this set for a very inexpensive price at an antique mall a couple of years ago and really like the colors. 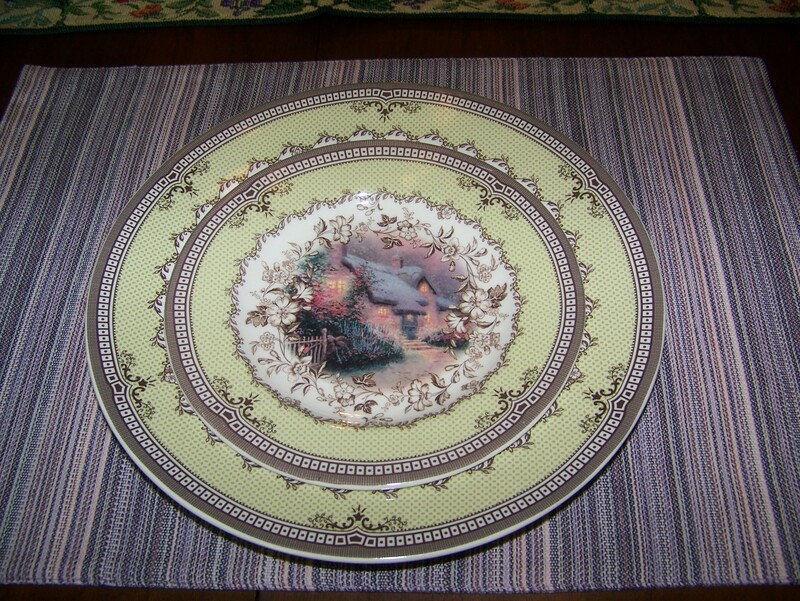 However, when I started with the table, I realized that I really did not have a runner that looked good with them. 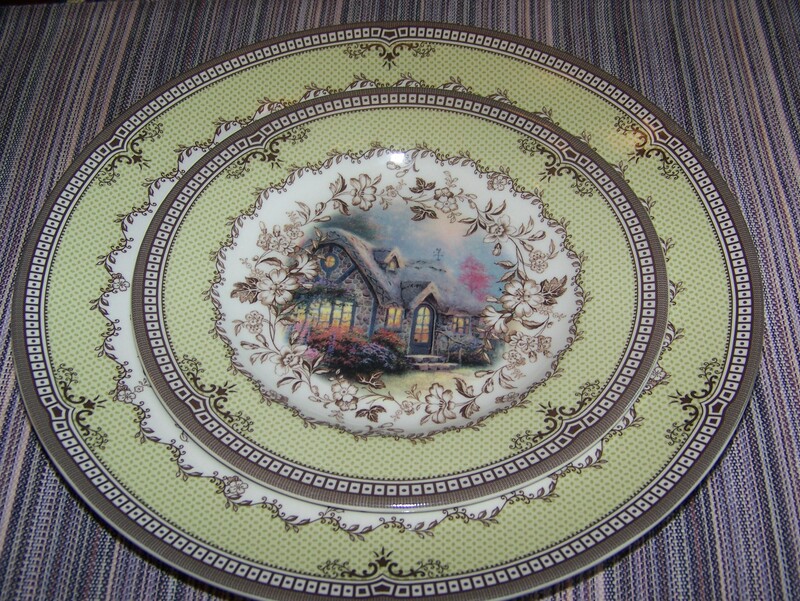 I finally chose the one at the top of the page because it is the only one I have that has even a little bit of purple in it and the green will go with the Thomas Kinkade china. 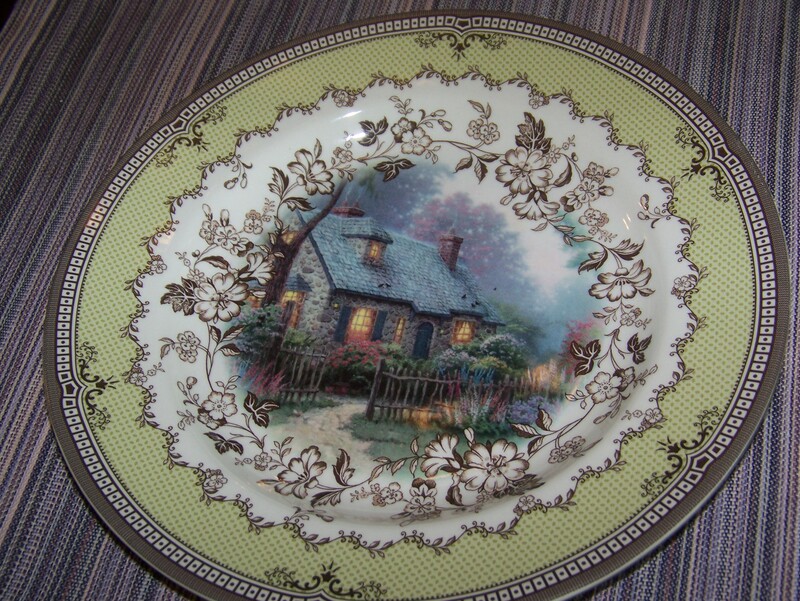 I love these plates! 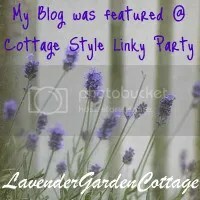 I like using purple with them because of the purple hues in the paintings of the houses. 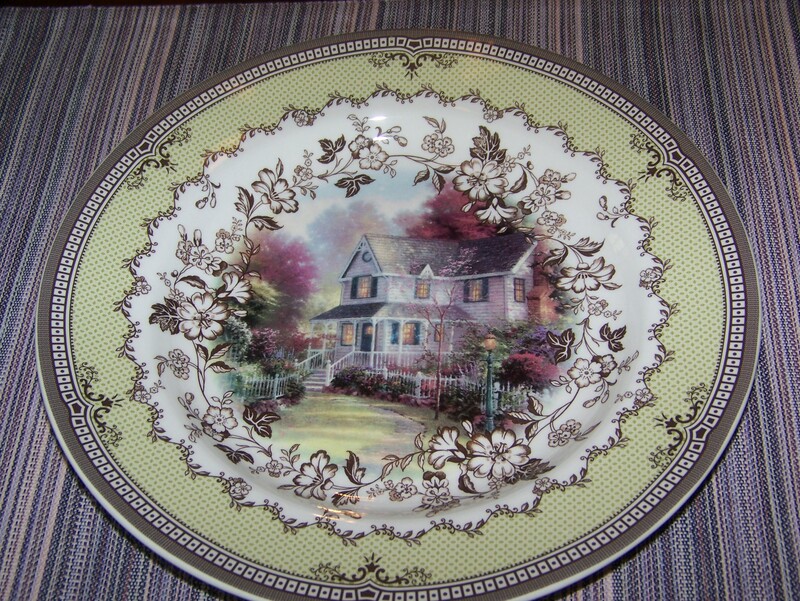 Each plate has a different house on it. 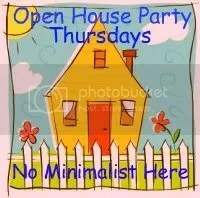 The small plates also have different houses. I decided to use both sizes of plates today. 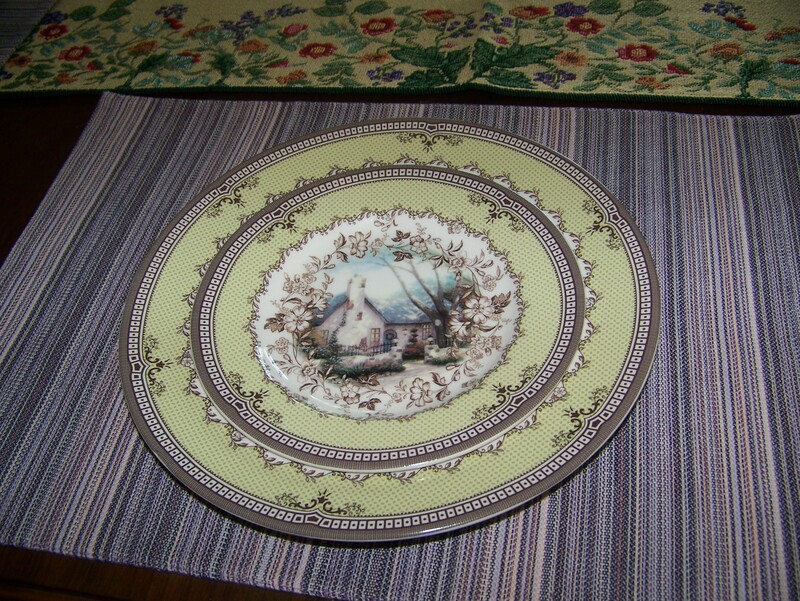 Love these pretty rims and how they frame the small plates. 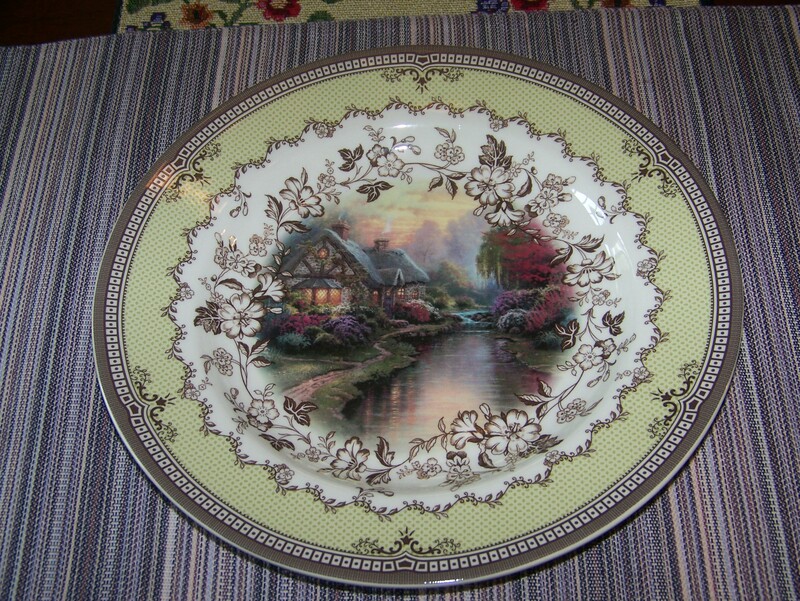 I never get tired of this beautiful china. 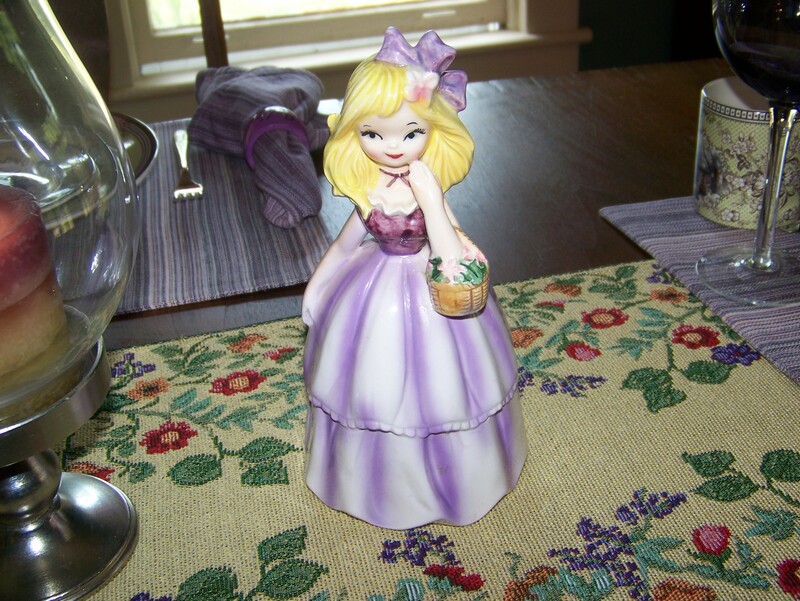 When I was looking through the napkin rings, I saw these purple ones that I rarely use. 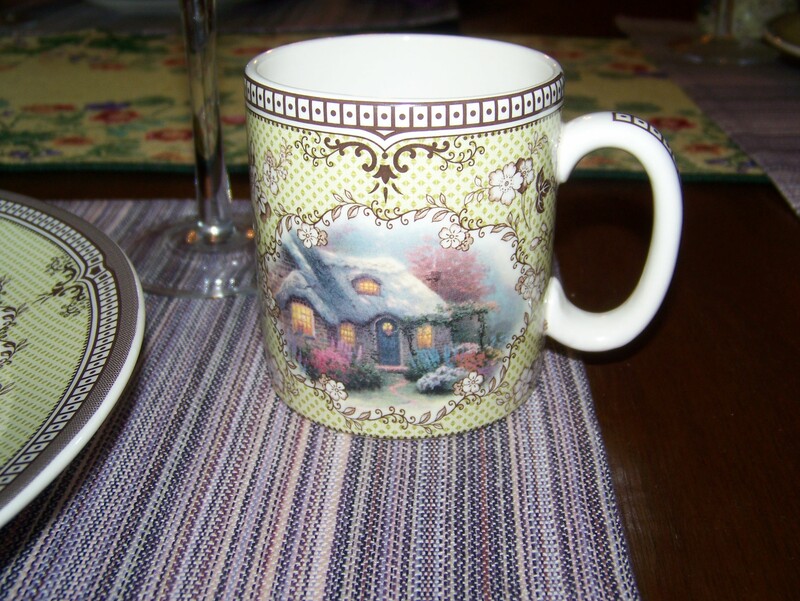 My mother found them for me at a local thrift shop and I think they look great with these napkins. Since I rarely use the mugs, I decided to pull them out today. 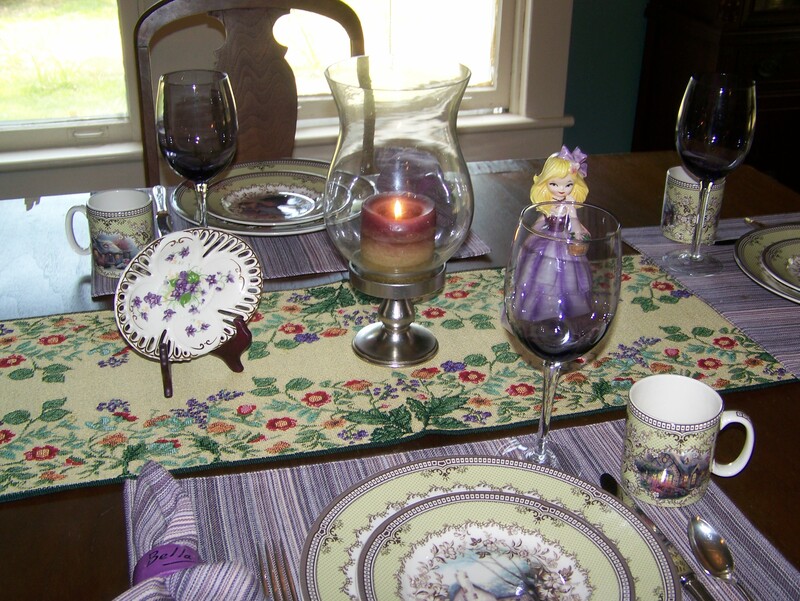 I also used my favorite purple goblets. I haven’t used my Grosvenor silver in a while, so I pulled it out. 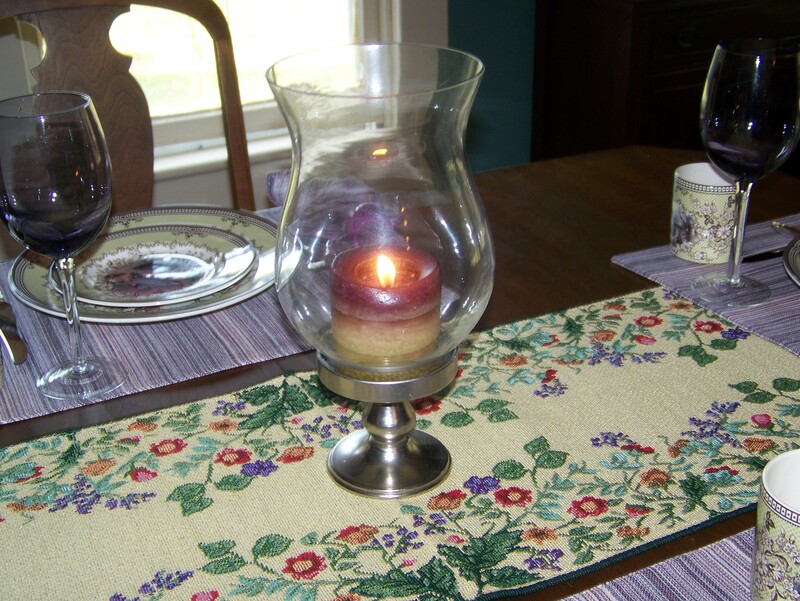 Keeping the centerpiece simple so that I can concentrate on the table linens, I chose my purple variegated candle and put in on my silver holder with the hurricane globe. I’ve had this lovely lady since I was a child. She is actually floralware and came holding a lovely bouquet of flowers. I’ve always loved her colors. 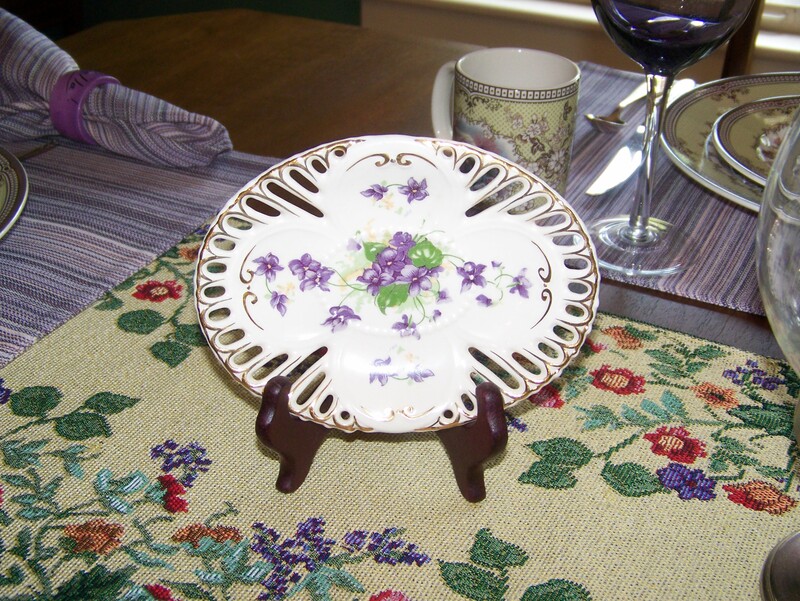 My sweet little pierced candy dish with the violets was the final choice to display. As much as I love this table, I’m almost 100% sure that I will let these linens go. I really don’t have much that goes with them and don’t use them very often for that reason. There is just no need for them to take up storage space when I so seldom pull them out. The napkin rings will go with them for the same reason. OK, now for the update on my eyeshadow palette challenge. 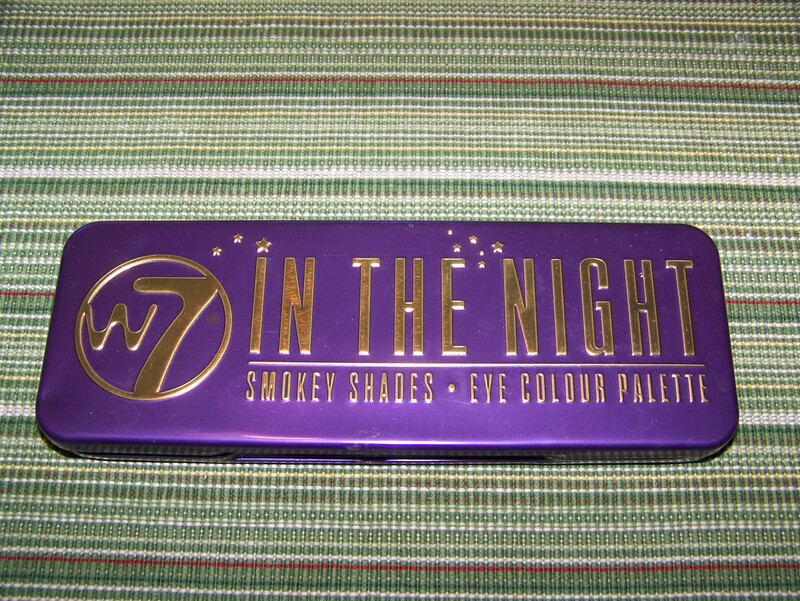 I have been using the W7 In the Night palette every day since August 1. 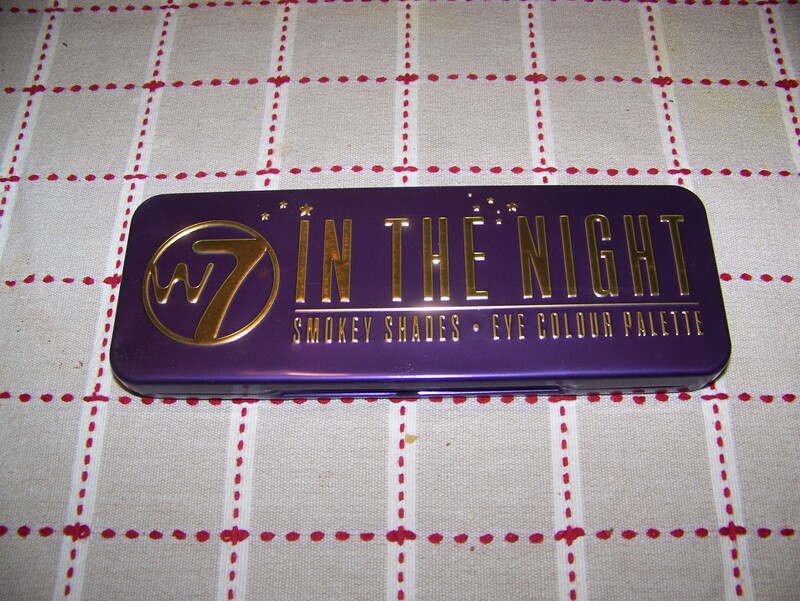 I chose this palette because it has deeper shades which I thought would blend better with the single eyeshadow in smoky plum that I have chosen for the “use it up” portion of my beauty product challenge. 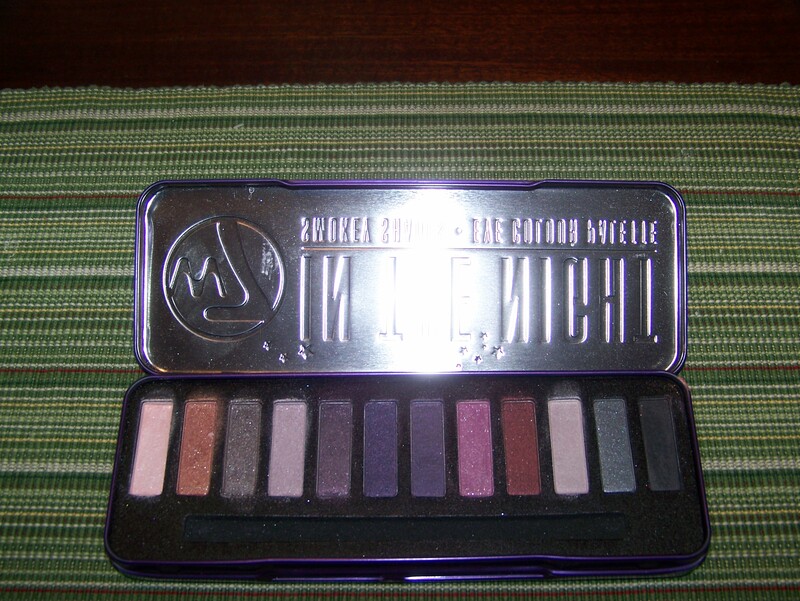 I tried all of the colors and there were a few that I liked the best with the plum eyeshadow. The last color on the left is called Dusty, and I really liked it as an all over base. I also used the fourth color in, Atlanta, a good bit. I know you see some purples in this photo, but I actually did not end up using them as much as I thought I would. 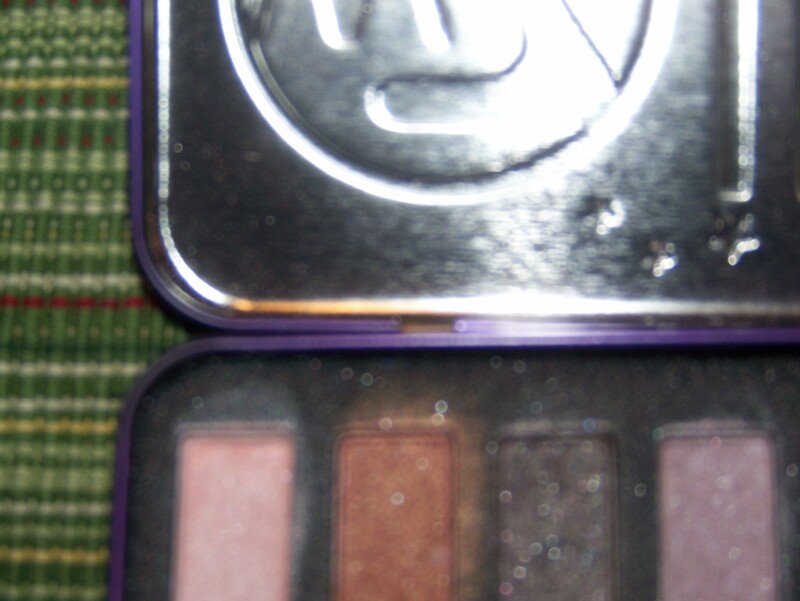 Those purples just did not look great with the plum eyeshadow that I am panning. I actually ended up liking the bright pink shade, Lady Luck, a good bit. It is a little more sparkly than I usually wear, but I was able to blend it out above and/or around (depending on where I placed the plum shade that day) so that it all blended into a nice look with only a hint of the sparkle. Another color I liked to use is the middle one in this photo, Party Pooper. 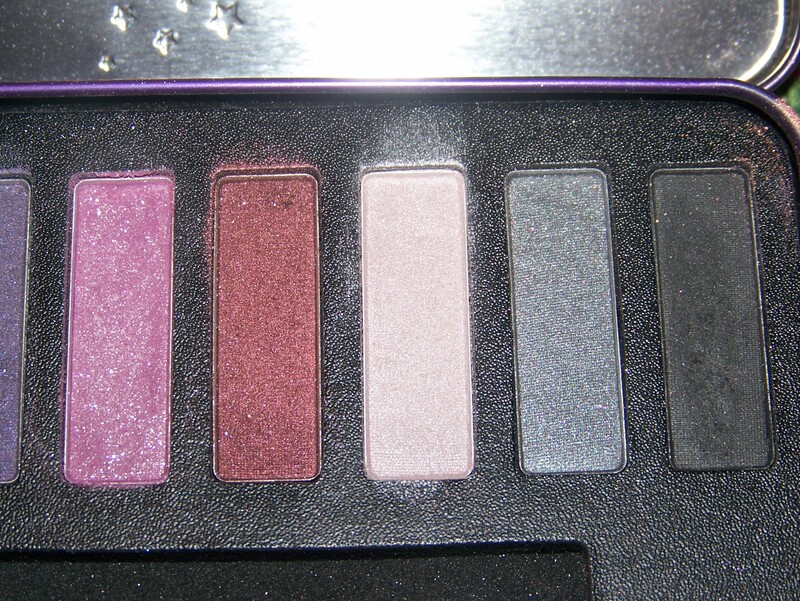 I can see noticeable dips in Party Pooper, Lady Luck, Atlanta, Abracadabra (the sparkly plum shade next to the purples in the previous photo), and Dusty. 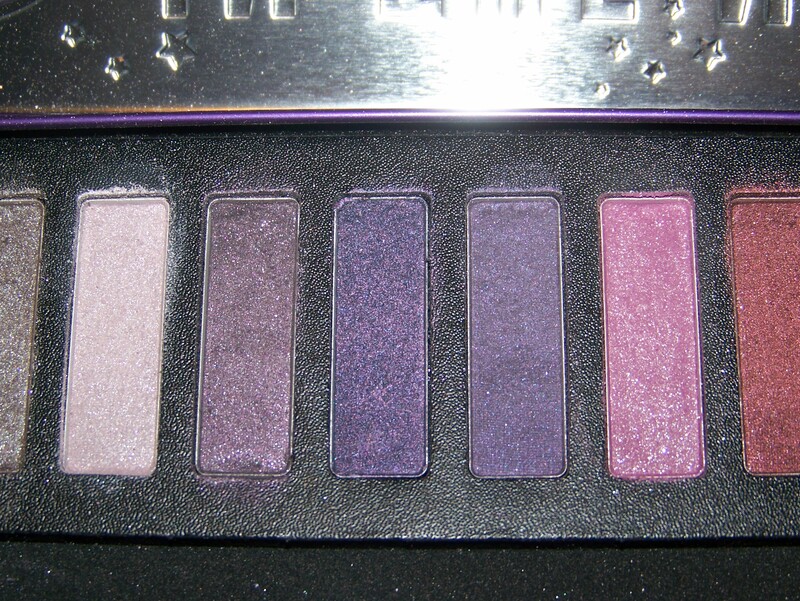 Of course, the palette was new and I did not expect nor was I trying to pan, so I was pleased with those little dips. Although I like the cute tin (it reminds me of the watercolor palettes I used when I was a child), it is not the best quality. Two of the 5 palettes arrived with one of the little hinge pins on the back either missing or broken. I tried to photograph it but didn’t really get a good picture due to the glare of the tin. Remember that I am using one palette at a time for an entire month, and I’ve had a hard time deciding on what palette to use for September. I made my final decision this morning. Since I used a larger palette last month, I decided to use a small palette this month. 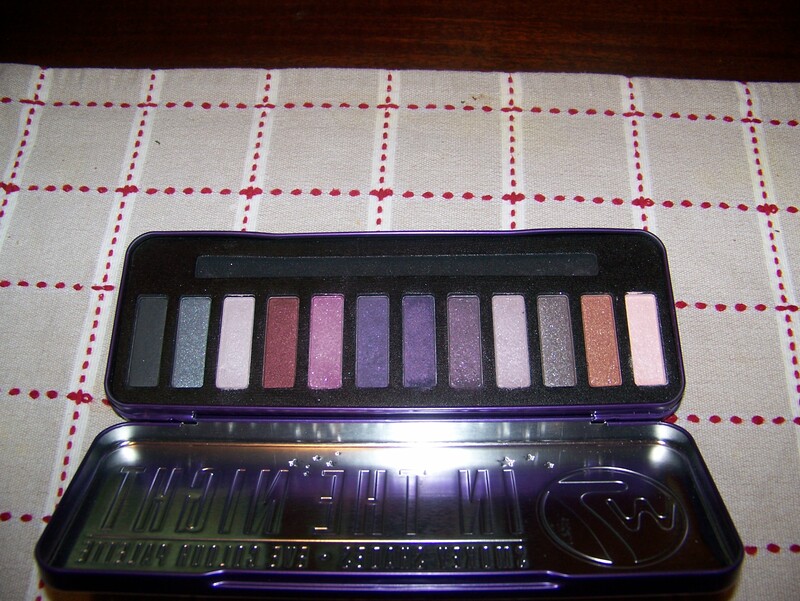 I have some small palettes in both Elf and Maybelline. The drawback to using a small palette is that using only those 4 colors for an entire month would get pretty boring. So here is my final decision. 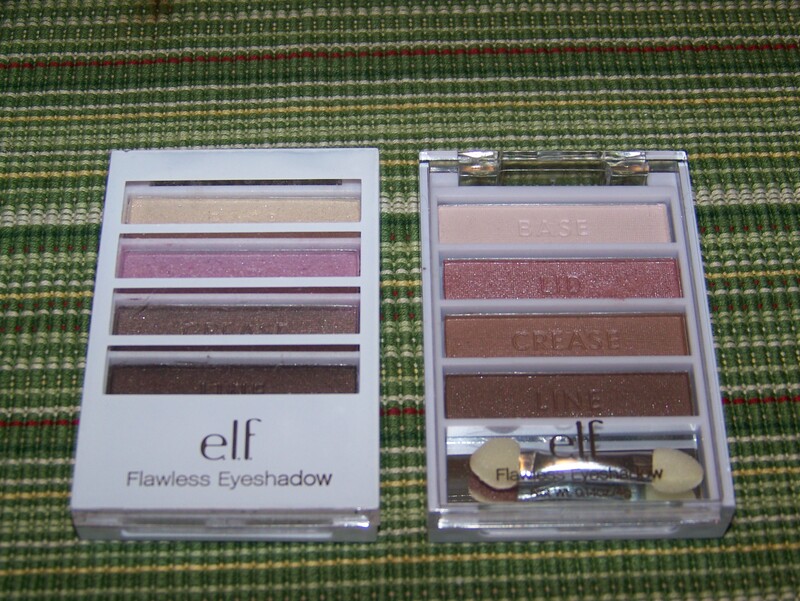 I chose 2 Elf Flawless Eyeshadow palettes for September’s one palette, one month challenge. The one of the left, Happy Hour, is one that I have used several times and know how much I like it. 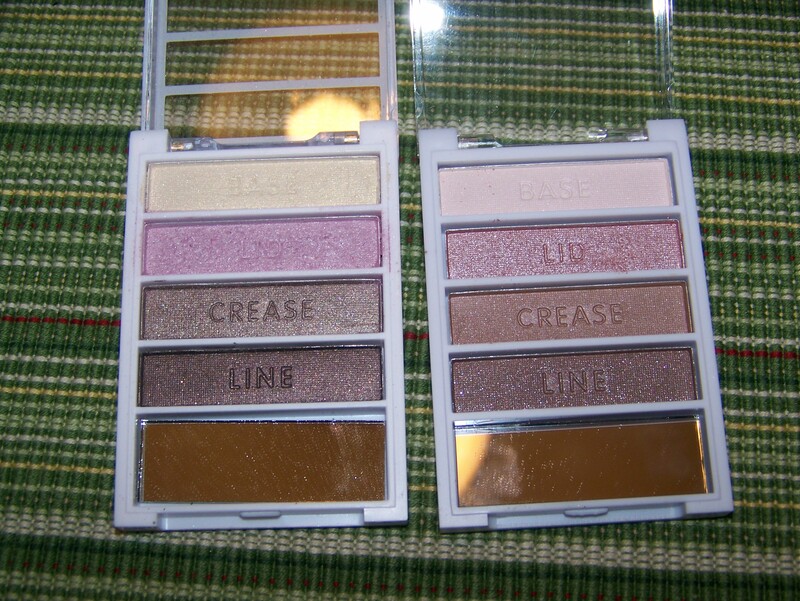 The one on the right, Blushing Beauty, is new, but I know that I have always liked the pinky/mauvey colors. I think that I will enjoy using these colors for the next month. I will update the panning challenges next week since they end on Labor Day. I won’t give away anything about how it is going at this time, but I will say that most of my goals have been realistic. Have a great week of tablescaping, purging, and beautifying! 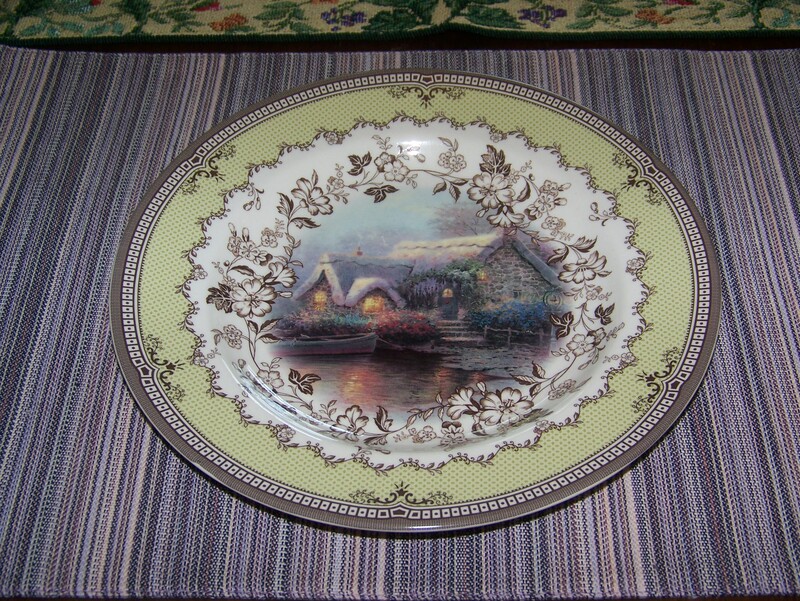 This entry was posted in Summer, Tablescapes and tagged antique mall, beauty products, Grosvenor, makeup review, purple, Silver, Spode, Thomas Kinkade. Bookmark the permalink. I really need to go through and purge some of my table linens. I just don’t use them enough to keep them. Seems I stay so busy these days! 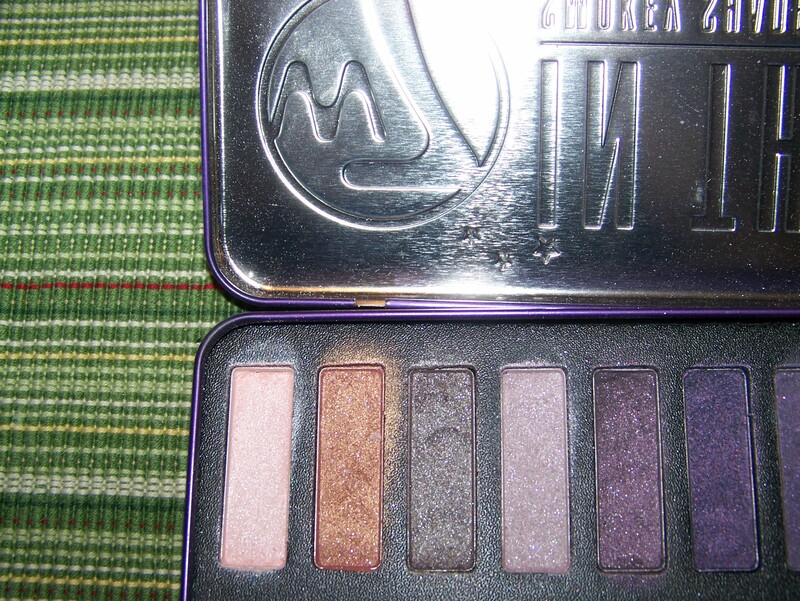 Anywho, I love the colors of eyeshadow you chose for September. Very pretty! Have a lovely week! I have decided that I have a problem with purging! Haha!! I really need to do that. Those plates are absolutely fabulous. What a find. 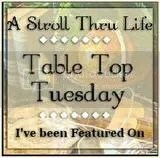 I also love that your gorgeous eyeshadows match the table colors! How fun to experiment with them! 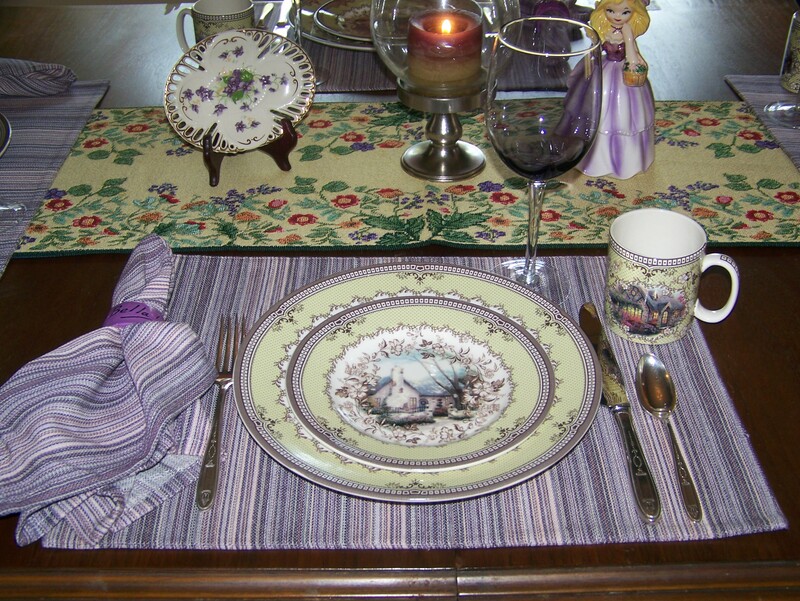 Your puple place mats and napkins are just perfect with your china! 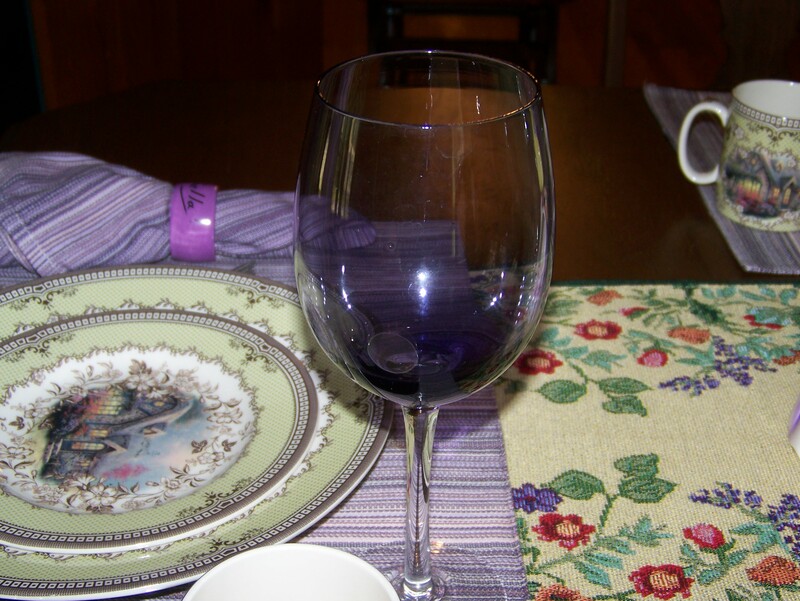 It causes the purple in the china to pop. Just keep these for the linens are so nice. Love all that you have. I sure love my purples. 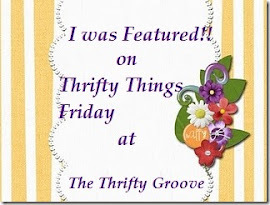 You have some gorgeous items. 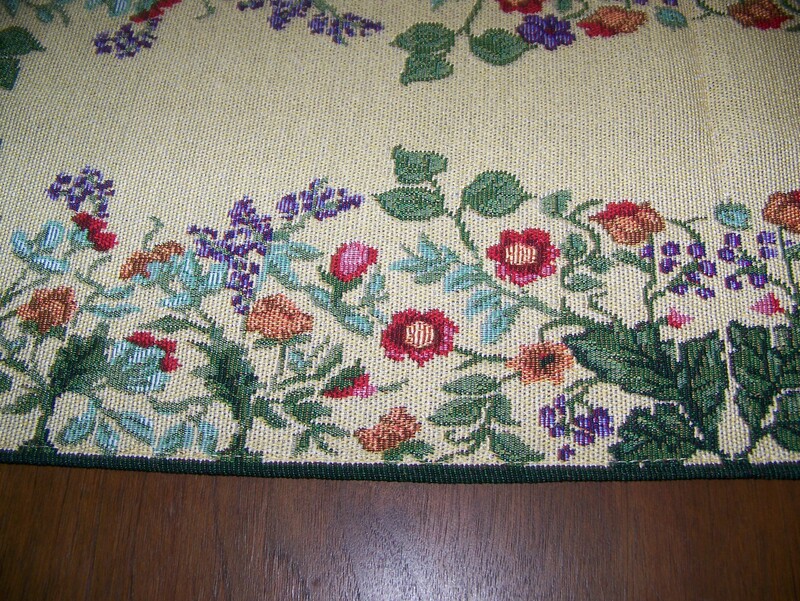 That floral table runner is so pretty! 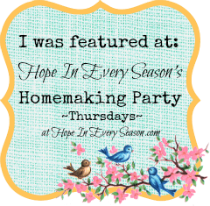 Thanks for joining Home Sweet Home!